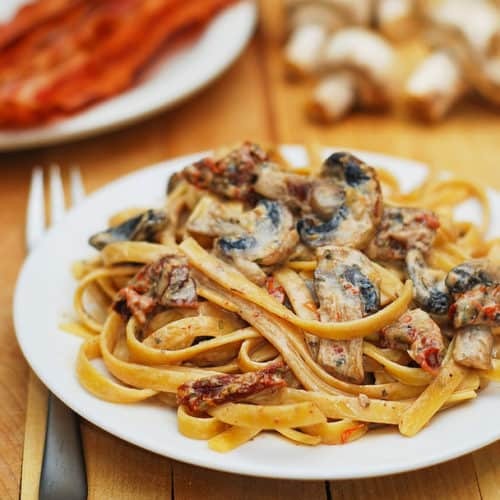 Easy, Italian-style recipe: Sun-dried Tomato and Mushroom Pasta in a Garlic and Basil Cream Sauce. 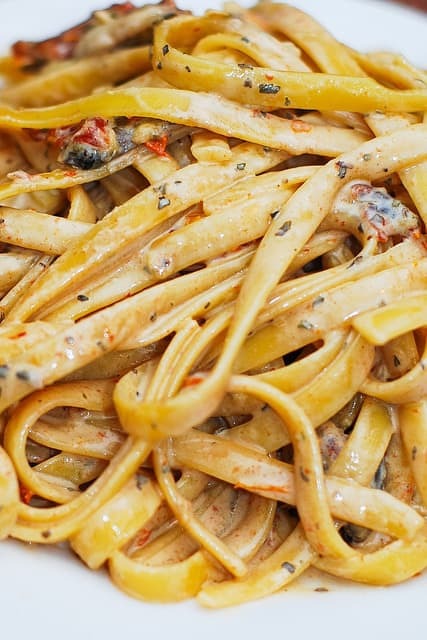 Enjoy this meatless pasta as is, or serve it with grilled chicken or grilled veggies! 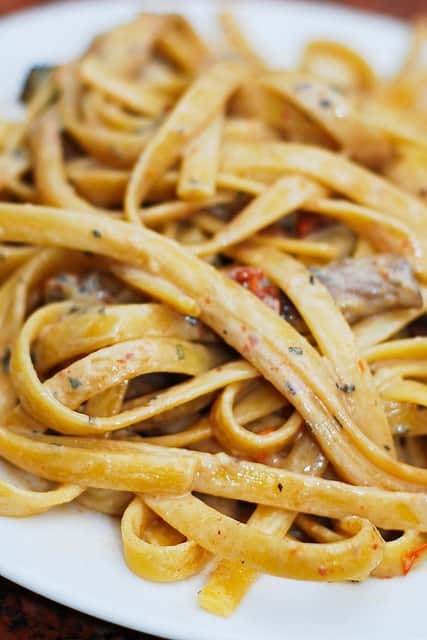 The fettuccine pasta is tossed with sun-dried tomatoes, garlic, mushrooms, and basil in a very tasty, creamy and velvety sauce. 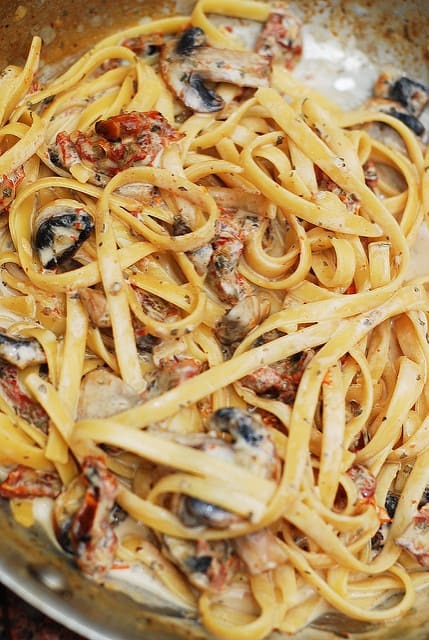 This Italian-inspired dish is great served with a garlic bread on the side. And a big fresh salad. And please, don’t forget about a glass of wine. I’ve been eating the leftovers for 3 days now, and the pasta + the sauce still taste just great! The pasta is best reheated in a pan, on medium heat, with a little bit of milk added gradually to thin the sauce as it gets reheated. 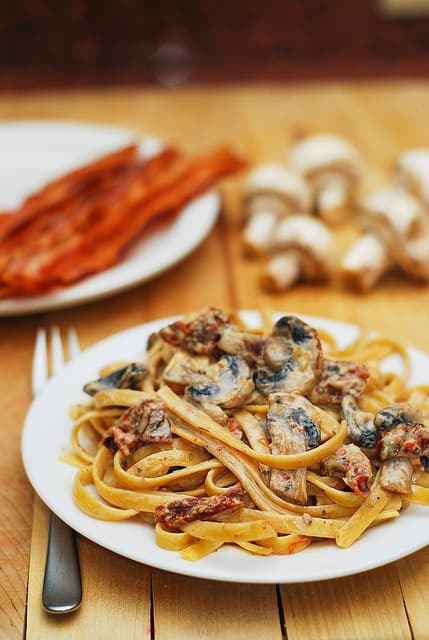 This delicious, meatless pasta dish is TOTALLY WORTH making it! WHAT IS HALF AND HALF? Half and half is the US milk product that combines half milk half cream to form a lighter cream unlike heavy cream. To make 1 cup of half and half, combine 1/2 cup milk and 1/2 cup regular cream (heavy, or whipping cream). This was incredible and so flavourful. I opted for coconut milk instead of heavy cream and though I’m sure it tasted a bit different, turned out wonderfully. So glad you liked it! Yes, the coconut milk works great as a replacement for heavy cream! Did you use 3.5 oz by weight for the sun-dried tomatoes, or 3.5 oz by fluid volume of sundried tomatoes packed in oil? Big difference of 3.5 fluid oz versus 3.5 oz dry weight. Thanks for clarifying! I used 3.5 oz of sun-dried tomatoes packed in oil. I did drain the oil so that the sauce is not greasy. 3 people better bring something to eat! 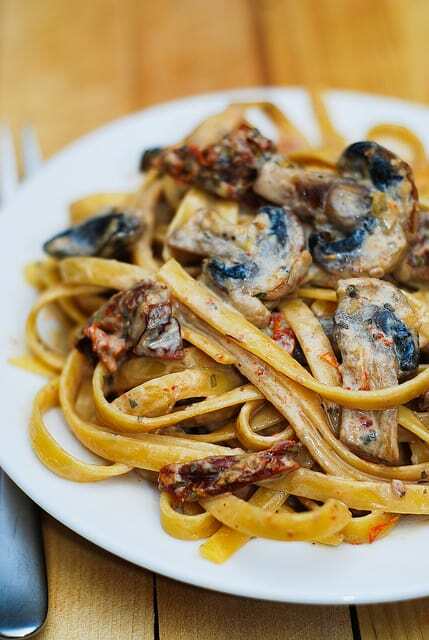 Well, it’s not only pasta, it’s also the chicken and all the other ingredient together with pasta!